In the mid 1970's Wes Humpston started working at Zephyr Surf Shop crediting C.R. Stecyk III and Jeff Ho as mentors. 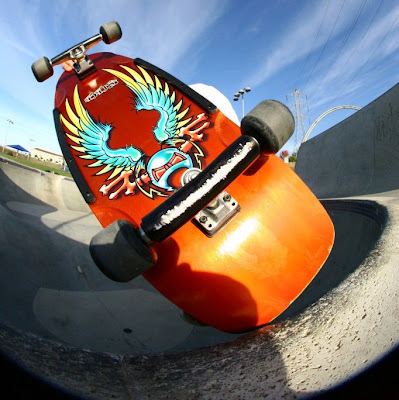 That’s about when he started drawing designs on the bottom of his skateboards, something which was unheard of at the time and that’s what started to make him real famous. His early skateboard art looked like the kind of pictures boys today make in their notebooks. But the design rapidly changed and his inspiration would later come from magazines like Surfer, Hot Rod, and Creepy, one of his favorite. He also drew “Stony caricatures we picked up from Zap Comics or an album cover or something like that.” Around 1974 the boards were useless: there were too small, too skinny, not adapted to the new skateboarding forces and the pool revolution. So, he started making wooden skateboards out of any kind of wood he could find, some he made out of flexible ply wood. The “aha” moment came when he put concave in the boards: “I tied a brick to it to put rocker in it, then fiberglassed both sides of it with sand stuck to the top for grip. 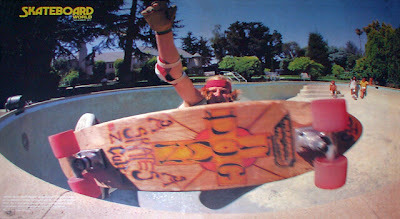 The trucks were held in with wood screws and I had Cadillac wheels with loose bearings (this board was a health hazard! ).” he recalls in his website. Wes’ designs and ideas soon became pretty standard on pool boards & most skateboards from then on. In 1980, skateboarding went bust and he got into printing. He started to do free-lance designs for friends: Jim Muir, the 80's DT crew, Burt Lamar's snowboard , Natas Kaupas's Santa Monica Airlines board and his skate shoe with Etnies. In the 90's he designed a lot for surfboard companies. When he was let go from a pretty good job, he was doing boards on the side and the business was not so bad, so he started doing them full time by setting up Bulldog Skates with Rich Fozmire, who was a collector and wanted to do a high quality product line of boards and wheels.